Customer built new unit to increase production. H2S line prone to corrosion at two different 90s before overhead line. 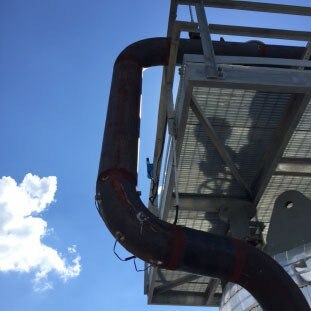 Elected to use non-intrusive permanently installed UT sensors to monitor pipe intrados, extrados, top & bottom locations in lieu of installing a heat trace to maintain dew point. Monitoring interval: 1 reading every 2 days, transmission every 6 days. Estimated battery life ~4 yrs.